Northumberland is a traditional, ceremonial and administrative county in northern England. The ceremonial county borders Cumbria to the west, County Durham to the south and Tyne and Wear to the south east, as well as having a border with the Scottish Borders council area to the north, and nearly eighty miles of North Sea coastline. Since 1974 the county council has been located in Morpeth, situated in the east of the county at 55°10'07N, 1°41'15W ; however Morpeth and Alnwick both claim the title county town. 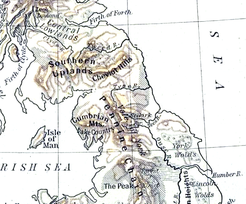 As the kingdom of Northumbria under King Edwin, the area's historical boundaries stretched from the Humber in the south to the Forth in the north. The traditional county covers a smaller area, similar to the modern ceremonial county but also including Newcastle-upon-Tyne, the traditional county town. 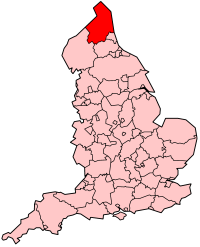 In 1974 however, the new metropolitan county of Tyne and Wear was created, and some areas traditionally within Northumberland are now administratively in Tyne and Wear. For some purposes, particularly wildlife recording and many sporting organisations, the administrative boundaries are not followed, retaining Newcastle-upon-Tyne and North Tyneside within Northumberland. Indeed, the county of Tyne and Wear is not indicative of the 'attachments' of the local population; residents of Newcastle would more readily identify themselves with Northumberland than their rival city, Sunderland, another place brought within the boundaries of Tyne and Wear in 1974. Northumberland's county flower is the bloody cranesbill (geranium sanguineum). Once part of the Roman Empire and the scene of many wars between England and Scotland, Northumberland has a long and complicated history. This explains the many castles in Northumberland, including among the better-known those at Bamburgh, Dunstanburgh, Warkworth and Alnwick. The region of present-day Northumberland once formed the core of the Anglian kingdom of Northumbria. Northumberland is called the "cradle of Christianity" in England, because it was on Lindisfarne, a tidal island north of Bamburgh, also called Holy Island, that Christianity flourished when monks from Iona were sent to convert the English. Lindisfarne was the home of the Lindisfarne Gospels and Saint Cuthbert, who is buried at Durham Cathedral. Bamburgh is the historic capital of Northumberland, the "royal" castle from before the unification of England under one monarch. The capital of Northumberland now, however, may be thought to be the market town of Alnwick, mainly because the Duke of Northumberland has his home there; or may be thought of as Morpeth, since Northumberland County Council's offices are in that town. The lords of Northumberland once wielded inordinate power in British affairs because, as the Lords of the Marches, they were entrusted with protecting England from Scottish invasion. Northumberland has a history of revolt and rebellion against the government, as seen in the Rising of the North in Tudor times. These revolts were usually led by the then Dukes of Northumberland, the Percy family. Shakespeare mentions one of the Percys, Harry Hotspur. The county was also a centre for Catholicism in England, as well as of Jacobite feelings after the Restoration. Northumberland became a sort of wild county, where outlaws and border reivers hid from the law, as it was largely rural and unpopulated. However, the frequent cross-border skirmishes and accompanying local lawlessness largely subsided after the union of the crowns of Scotland and England under King James VI and I.
Northumberland played a vital role in the industrial revolution. The region's coalfields fuelled industrial expansion in other areas of the country, and the need to transport the coal from the collieries to the Tyne led to the development of the first railways. Ship-building and armaments manufacture were other important industries. Today, Northumberland is still largely rural. As the least populated county in England, it commands much less power in British affairs than in times past. In recent years the county has enjoyed considerable growth in tourism due to its scenic beauty and the abundant evidence of its historical significance. The physical geography of Northumberland is diverse. It is low and flat near the North Sea coast and increasingly mountainous toward the northwest. The Cheviot Hills, in the northwest of the county, consist mainly of resistant Devonian granite and andesite lava. A second area of igneous rock underlies Whin Sill (on which Hadrian's Wall runs), an intrusion of carboniferous Dolerite. Both ridges support a rather bare moorland landscape. Either side of Whin Sill the county lies on carboniferous limestone, giving some areas of karst landscape. Lying off the coast of Northumberland are the Farne Islands, another Dolerite outcrop, famous for their bird life. Being in the far north of England, above 55° latitude, and having many areas of high land, Northumberland is one of the coldest areas of the country. It has an average annual temperature of 7.1 to 9.3 °C, with the coldest temperatures inland. However, the county lies on the east coast, and has relatively low rainfall, between 466 and 1060 mm annually, mostly falling in the west on the high land. Between 1971 and 2000 the county averaged 1321 to 1390 hours of sunshine per year. Approximately a quarter of the county is protected as the Northumberland National Park, an area of outstanding landscape that has largely been protected from development and agriculture. The park stretches south from the Scottish border and includes Hadrian's Wall. Most of the park is over 800 feet (240 metres) above sea level. At the Census 2001 Northumberland registered a population of 307,190, estimated to be 309,237 in 2003. In 2001 there were 130,780 households, 10% which were all retired, and one third were rented. Northumberland has a very low ethnic minority population at 0.985% of the population, compared to 9.1% for England as a whole. 81% of the population reported their religion as Christianity, 0.8% as another religion, and 12% as having no religion. Like most English shire counties Northumberland has a two-tier system of local government. 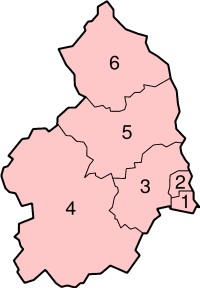 It has a county council based in Morpeth and also has six districts, each with their own district council. These districts are, Blyth Valley, Wansbeck, Castle Morpeth, Tynedale, Alnwick and Berwick-upon-Tweed. The county and district councils are responsible for different aspects of local government. Northumberland is represented in Parliament by four MPs, of whom one is a Conservative one is a Liberal Democrat and two are Labour. This is a chart of trend of regional gross value added of Northumberland at current basic prices published (pp.240-253) by Office for National Statistics with figures in millions of British Pounds Sterling. Northumberland has a relatively weak economy amongst the counties and other local government areas of the United Kingdom. The county is ranked sixth lowest amongst these 63 council areas. In 2003 23% of males and 60% of females were earning less than the Council of Europe's decency threshold. As of May 2005 unemployment is at 2.3%, in line with the national average. Between 1999 and 2003 businesses in the county grew 4.4% to 8,225, making 0.45% of registered businesses in the UK. A major source of employment and income in the county is tourism. The county annually receives 1.1 million UK visitors and 50,000 foreign tourists who spend a total of £162million in the county. Northumberland has traditions not found elsewhere in England, reflecting a mix of indigenous, Celtic, Norse and Anglian influences. These include the rapper sword dance, the Clog dance and the Northumbrian smallpipes (a type of bagpipe). Northumberland also has its own tartan, often referred to in Scotland as the Shepherd’s Tartan. Traditional Northumberland music sounds similar to Scottish music, reflecting the strong historical links between Northumberland and Scotland. In general, Northumberland culture has more in common with Scottish Lowland culture, the two perhaps having more in common with each other in some respects, than with other parts of their respective countries. The links between Northumberland and Scotland are audible in the dialects of both, which include many Old English words, such as bairn for child. Attempts to raise the level of awareness of Northumberland culture have also started, with the formation of a Northumbrian Language Society to preserve the unique dialects (Pitmatic and Northumbrian) of this region, as well as to promote home-grown talent. Northumberland has its own flag, based on the design first used on the tomb of St Oswald in the 7th century. 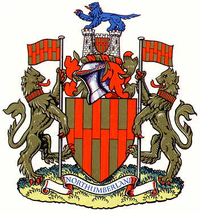 The current version was granted to the county council in 1951, and adopted as the flag of Northumberland county in 1995. Having no large population centres, the county's mainstream media outlets are served from nearby Tyne and Wear, including radio stations and television channels (such as BBC Look North, BBC Radio Newcastle, Tyne Tees Television and Metro Radio), along with the majority of daily newspapers covering the area (The Journal, Evening Chronicle). Newspapers focusing exclusively on Northumberland or its districts include the Northumberland Gazette, Morpeth Herald, Berwick Advertiser, Hexham Courant and the News Post Leader. Lionheart FM, a community radio station based in Alnwick, currently broadcasts under a series of temporary licenses and is in the process of applying for permanent status. Radio Borders covers Berwick and the rural north of the county. These are the main towns in Northumberland.